The topic of the educational miniature golf has been hot in the social media world. In our last installment (Part 4) we covered 3D courses, art and education and one class that combined a ton of disciplines into one learning objective. The articles we've select below also cover such varied topics and continue to provide excellent ideas of how our sport can be integrated into a curriculum at all levels. Thank you goes out to all of the other news organizations who are taking the time to cover these events so that they get the proper recognition they deserve. Our first article brings the minigolf experience down to the kindergarten level and comes from New York, USA. The kids built Haldane�s Putt N� Play over a six week time period, putting together some of the basic lessons they were learning around force with the fun of building something with the crazy stuff they could find around the house. The course ended up with 11 holes, which were all appropriately kid themed from cotton candy to lightning. Beyond getting to play the results, the kids shared the experience with their parents. In what might be the best learning point of the story, the kids also had to "staff" the various jobs that come with running a miniature golf course including a club distributor and greeter. Who knows - this experience might create a budding course owner in the future! We go from kindergarten to the university level for our next look at an educational use. In Abeline, Texas, USA, engineering and physics students in November came together to build 14 holes of minigolf as part of a semester-long project. Many of the holes were inspired by local people/events/areas to the university and while they were technically challenging given the background of the students, they also needed to have a flair for presentation to win some of the awards. It goes to show that students can be proud of what they do in building a miniature golf course whether they be 5 years old or 20 years old! Our next article comes from Darmstadt, Germany and the Eleonora School. The original article is in German (easily translated through Google Translate) but we can tell you that it featured 13 students from grades 5-8 who participated in a two part learning experience with respect to the game. First, the students visited an actual miniature golf course and learned about items such as technology and ball material and then played a bit. They then took this learning back inside to construct their own holes for a presentation later in the week. That makes for a great combination of not only testing your design and construction skills but also getting out to a real course to showcase your putting skills. 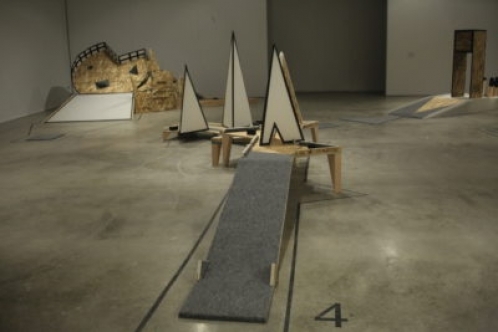 For our last article we return to the United States and Colorado State University where over 30 art students produced the Mulligan minigolf course. In this instance, it was less of a known long-term project and more of a short-term competition. The art students were briefed on various aspects of the project one evening but had no idea they were building a miniature golf course when they showed up to begin the next day. They had just a week to design and build the course, following some preset rules about what materials and designs they needed to incorporate into the hole. At the end their projects were displayed for a few weeks in the art gallery at the university. One of the best parts noted in the article was the coming together of various art disciplines (scuplting, painters, etc) as well as graduate and undergraduate students, showing of minigolf can be a very collaborative device (maybe some politicians should try using a minigolf course instead of a "big" golf course to make some action happen!). Do you know of miniature golf being used to enhance learning? Let our editor know at patsheridan@minigolfnews.com.